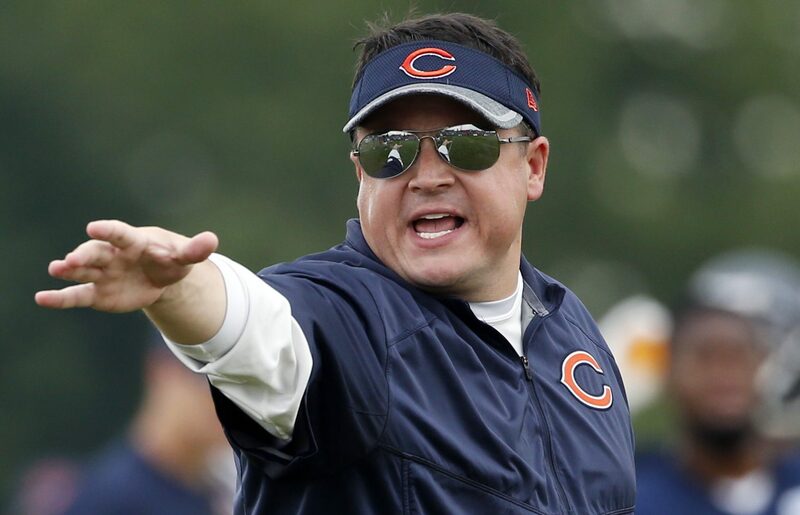 The fall guy for the 2016 Chicago Bears is most likely going to be Dowell Loggains and really, it’s too bad. The Bears are 11 games into a miserable season and next-to-last in points per game, which could tell you the Bears have a terrible offensive coordinator. But I am just not sure that is true. The Bears should’ve won and should’ve scored at least 34 points last week with their JV offense. This is a results-based industry, I get it. But isn’t there something to be said about having the Bears in the middle of the pack in yards with the majority of their snaps being taken by Matt Barkley and Brian Hoyer? No, they didn’t score with Jay Cutler either. But Cutler has been hurt all season. And, come to think of it, the only coaches who have scored a lot of points with Cutler are Mike Martz and Marc Trestman. Even the great Mike Shanahan never finished better than 16th in scoring with Cutler has his quarterback. They didn’t actually score enough last week. That’s because Barkley threw two interceptions in the red zone and Josh Bellamy dropped an easy touchdown. That’s 13 points that players, not the coaches, left on the board. That was a win that the players, not the coaches, let escape. Good players score touchdowns. Coaches just put them in position. There are a handful of Bears fans who want the team to hire Kyle Shanahan to replace John Fox as the head coach. Shanahan has the top-scoring offensive unit in the league. You know what else? His teams have finished in the bottom third in scoring five times. Other “offensive geniuses” like Norv Turner, Mike McCarthy and Josh McDaniels have finished 27th or worse. It happened because they didn’t have good players. I thought it would take a miracle for the Bears to move the ball with Brian Hoyer and another for them to do anything with Matt Barkley. Yet, they did. After watching Sunday’s game live, I thought Barkley was terrible, but two more viewings have helped me determine he was OK. If the Bears had cut their drops in half and caught just the most costly of the bunch, Barkley would’ve finished 34/54 with 345 yards and four touchdowns. Not bad. After a tough start, he was accurate and poised. He delivered strikes and took chances with passes deep down the field. He was excellent on the team’s last three drives. Of course, it also seemed that when he was pressured, he panicked and made a big mistake. For the most part, the Bears offensive line kept him clean. Can Barkley survive if he’s being harassed all game? I have no idea, but I want to find out. Before the season, I thought Bryce Callahan and Adrian Amos had excellent chances of being fixtures in the Bears secondary. Now, I’m not sure either will have a job next year. Amos is the opposite of Chris Conte. He can come up and deliver a big hit in run support and is a sure tackler. He was adequate in coverage as a rookie, but has regressed this year. The Bears could live with that if he delivered the occasional big play or takeaway, but he doesn’t. He had two chances last week, but let an interception go through his hands and failed to recover a fumble at his feet. Callahan’s biggest issue is injuries, but he seems to give up at least one big play a game and tends to commit penalties at terrible times. Like Amos, Callahan is athletic and aggressive, but he isn’t progressing the way I expected. Both Amos and Callahan were responsible for two catches of 25 or more yards on Sunday. They deserve the chance to compete for jobs next year but nothing should be handed to them. Forgive me if I refuse to get excited about the team promoting Daniel Braverman from the practice squad. I loved the fact that the Bears used their seventh-round draft pick on the kid from Western Michigan and I think he can be a capable NFL receiver, but I need to see it before I get excited. Braverman had two good weeks in training camp, then disappeared. If he had been playing well on the practice squad, it wouldn’t have taken 12 dropped passes for him to get on the field. He was a draft pick and the Bears need to give him a shot. But every other NFL team had two chances to bring him in and they all passed both times. Maybe he’ll prove everybody wrong, but we really haven’t seen any indication that that is the case. It would be a big mistake to take snaps away from Marquess Wilson or Cameron Meredith in order to play Braverman. • PFF had the Bears with 10 drops, ESPN had them with eight and I had them with 12. Perhaps they didn’t count the last pass to Thompson or a back-shoulder catch Jeremy Langford should’ve made, but I did. The biggest culprit was Meredith, who dropped four passes, while Bellamy dropped three. • Pernell McPhee can talk trash with the best of them, but he has been MIA two straight weeks. I had him with a stuff, but no pressures on Marcus Mariota. The strength of the Bears is supposed to be their front seven, especially with McPhee and Willie Young, but they’ve been punched two straight weeks. • Eddie Goldman is slowly getting back in shape. He had two stuffs, both on plays in which he hustled down the line to make stops right at the line of scrimmage. The worst defense in the league against the second-worst offense. Something’s got to give. It’s been kind of low-key, but Colin Kaepernick has actually been decent this season. The problem is, the 49ers have been so bad defensively, giving up 31.3 points per game, a far cry from when Vic Fangio was running the show. The 49ers have given up the most passing touchdowns in the league. The’ve also given up the most rushing yards. The Bears may not have good enough offensive players to score against most teams, but they should be good enough to score against this defense. If Matt Barkley can play at all, he should feast this game. And this could be a career game for Jordan Howard too. The Bears really should win this game.